How Buzz Works - Create, Manage and Promote your Events. Everything you need to sell tickets online. Manage events like a Boss! We help organizers sell more tickets by engaging their audience, better managing their event and boosting revenue. Our tools are very easy to use for both small and large scale events. Setup beautiful event pages in just a few minutes. Add your own cover photo, event details and set up tickets for your event with ease. Sell tickets from your own website using our embed widget and share your event easily on popular social networks. You can also feature your event on Buzz for added exposure. Gain complete control of your event. 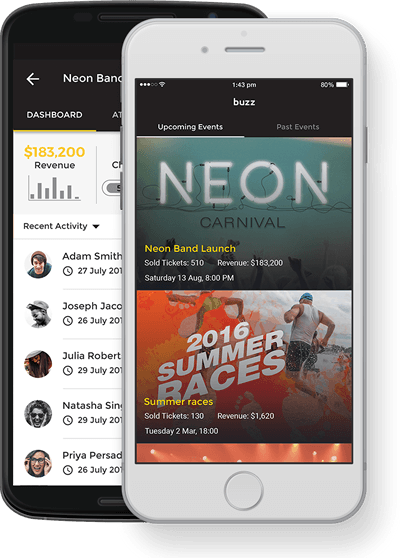 Track sales, manage orders, ticket inventory, guest lists, edit event content and enjoy dozens of other features. Add and manage your contacts and lists all on one platform! Knowledge is power. View event statistics in real time and gain rich event insight. Track sales by ticket type, top buyers, net revenue, event check-ins and much more.